Wasp and Hornet Spray kills flying stinging insects on contact with a very fast knockdown and kill. But unlike other wasp sprays, Wasp-X continues to kill with a foaming action that provides a residual activity to help eliminate the nest. 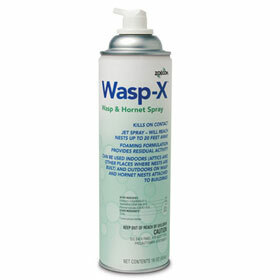 Wasp-X spray can reach nests up to 20 feet away. Upside down spraying allows for hard to reach nests. The water-based formulation is easy on plants and the active ingredient is safer for the environment yet tough on pests. 16 oz. can.